Art at the Bread of Life, Inc. The Art Project is a healing journey of affirmation. It is the place where the artist within gets the freedom to come out. For many reasons life takes different people on different journeys, journeys that have, for some, blocked the greatest part of our beings, the creative part. Most of us know what it is like to ‘do’…to ‘figure out’…but so many of us are unaware of how to undo those blocks and experience the freedom of creativity that can enable us to be set free for the journey, to be set free for life. Such is the Artist Way…a journey to help each of us to be the person we were originally intended to be…free to heal, free to renew, free to create, free to BE and to DO! A class for all levels from beginners to advanced. 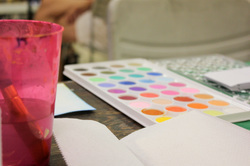 The instructor takes participants through the necessary steps to complete the subject of the day, helping them to learn watercolor techniques and honing a skill that they can use forever. From molding with play-do, coloring the Mandala, creating a collage expressing their happiest memory, to action painting outside in the courtyard, all guests are invited to work out their creative self and have some fun.